During Monday's press conference, head coach Ed Orgeron was asked about the third down play vs. Florida, where it looked like Clyde Edwards-Helaire gained a first down but the referee's marked it short. Instead of reviewing the spot on the field, LSU sent in Cole Tracy on fourth down to kick 33-yard field goal, which gave the Tigers a 10-7 lead over Florida in the second quarter. Here's what Orgeron had to say about the spot and his decision to kick the field goal. Q. Second quarter on the field goal drive on third down play on the TV it looked like Clyde had gotten the first down. Could you walk us through what your process is for if you're going to consider a challenge and maybe what happened there? ED ORGERON: Yeah, here's the process. They're going to tell me from upstairs whether we challenge it or not. No one from upstairs told me anything. We were making decisions on the sideline whether we were going to go for it or kick it. And I decided to get the points. I didn't want to be down in the red zone twice after the turnover and not get any points. So I thought it was 7-7, we'll get some points, we're going to be in good shape. Right after we kicked it, they said, hey guys, we should have challenged it, but the replay came in too late for us to make any decision on that. Now, watching it on the TV copy this morning, I wish I would have challenged it. I don't know what the outcome would have been, but I saw what everybody saw on TV. But by the time it got to me it was too late. Q. Is the replay that the guys in the booth used, is it the TV view too? 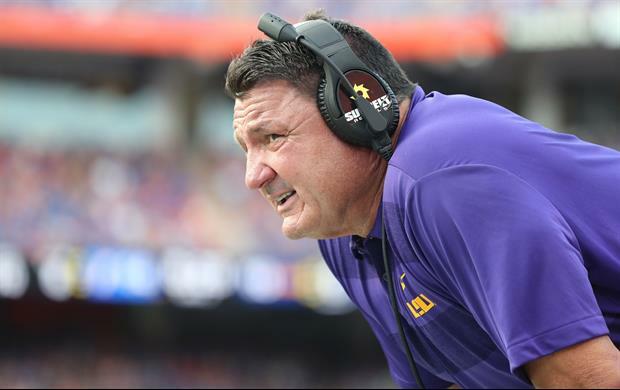 ED ORGERON: Yeah, I can't tell you exactly what it is, but I think that it's the same thing. The TV saw it -- what I saw on the TV, it looked like he was over but you couldn't completely tell where the ball was. That's what I saw this morning. We should get to the root of the problem here and stop bashing the coaches. And the root of the problem is incompetent and often biased referees. Anyone who doesn't believe these refs have money riding on games or are flat out paid to keep scores close or to favor one team for the win, is ignorant. How many times has even replay officials gotten calls wrong? More than I can count. It's an epidemic in sports today. That's why I quit watching games unless LSU or the Saints are playing in it. The officials are responsible to get calls right, spotting the ball etc. The game shouldn't rely on coaches to get things right that are governed by officials, the damn officials should get their own things right. Replay officials should have stopped play and made sure the ball was spotted right. So they obviously had money on LSU during the LSU vs Auburn game? The funny thing is the idiots on the board who think he had a good enough view of the play to know he should make a challenge. I think the morons think he should call a time out and challenge every play. Regardless of whether he gets a notification to do so or not. Well he does make it a habit to kick it on 4th and short.......see the Notre Dame game. Wanna know what ida done? I wish I could make mistakes like this at my job with zero consequences. Guy is making millions to not coach. Just watch him during the game... his mic is never down by his mouth because he contributes nothing to the game. He sits there and smells his fingers and picks his nose on camera, with the occasional clapping while saying “come on” so he looks like he’s doing something. BayouBengal99, you need to step away from the keyboard haha. The guys in the booth he's talking about are the replay officials not the coaches you idiots. My god y'all love to come up with any damn excuse you can to make the LSU coach look as bad as you possibly can. Man I hope we win the next three games because all you sorry arse fans can hit the road for good. I will never allow you to be on the side of this team or program ever again. Frick you MFers!! No he is talking about upstairs are LSU coaches. Evey team has people upstairs in the same booth as the OC. He went with the call on the field, took the points to get the lead in the 2nd, and didn't waste a timeout doing it. He did exactly what he should've done. You want to chat about wasting timeouts? Why do we call a timeout on 4th and 2 then punt? So it’s the coaches in the booth fault? That wasn't going to get confirmed, but it wasn't getting overturned. There wasn't an angle to see the ball at the time his knee hit. Not worth crying over, though. We had two chances to win or tie at the end and didn't get it. On to Georgia. BS. I disagree, there were two angles that showed pretty clearly that CEH was well past the line to gain. This doesn't jive with his excuse that it's all on him, but his coaches need to wake the frick up. Once again, in a loss, Orgeron doesn't accept responsibility for something he fricked up. How shocking! You're the worst type of LSU hater! How do we not have someone watching the CBS broadcast? It should have been reviewed by the replay booth regardless. Not on Ed. Yea let's hurry up and run out FG team on the field is what it looked like to me!!! There is a play clock, you have to hurry moron. Sounds like someone got an arse chewing for that. That is unacceptable for how much money is paid to the staff. I could see it. You could see it. The commentators could see it. But the people upstairs couldn't see it? Simply pathetic. Pretty much. I'm sure if it were Florida that whistle would have been blown immediately! The officials in the replay booth should have called for a replay independent of LSU. There are two SEC replay officials in there looking directly at the TV live feed. One of them should seen it and stopped play to review the spot. I agree with you, Florida got home cooking. The last time #11, the linebacker for Florida got hurt, he also committed targeting.